Throughout the Star Wars galaxy, bounty hunters ruthlessly track down their prey. For a man or woman with a death mark on their head, life is an uncertain proposition at best. Any bounty hunter can hunt their target and bring them in, dead or alive, to collect the reward. Yet even among these fearsome hunters, there are those who have created a legend for themselves. For these dangerous warriors and cunning schemers, hunting is not a career or a way to earn credits—it is the only lifestyle they can imagine, and they are very good at it. 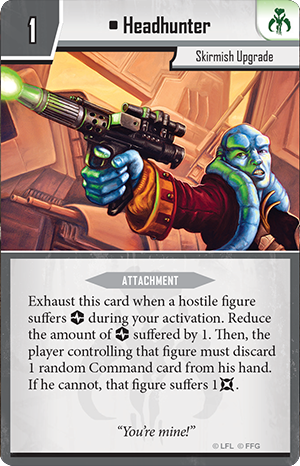 Today, we’ll take a closer look at one of those master bounty hunters and explore how you can hunt down your foes with the Bossk Villain Pack for Imperial Assault! Bossk is one of the most dangerous bounty hunters in the galaxy: a reputation cemented by the fact that he was one of the few chosen by Darth Vader to track down the Millennium Falcon. With the upcoming release of The Bespin Gambit, Bossk has taken a job on Cloud City that brings him into direct conflict with the Rebel operatives. As you might expect, a life of hunting has given Bossk a massive array of combat skills. Feats that demand exertion from others come as second nature to Bossk—a fact reflected by his inherent abilities. Rather than spending surges to gain these effects, Bossk receives increased damage and accuracy to every attack and gains a free block whenever he defends. If your foe does prove to have tougher armor than you can expect, you also spend one of your surges to pierce your enemy’s defenses and make sure your damage hits home. Even setting aside Bossk’s inherent abilities, he has the power to deal significant damage every round. 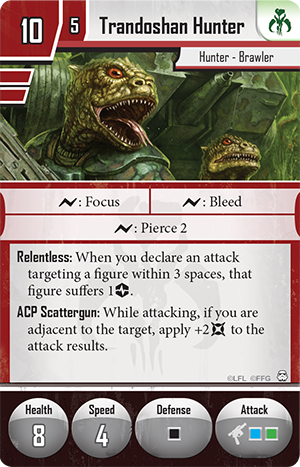 Bossk rolls one red die and one green die, making his attacks heavy on damage, and he also benefits from the Indiscriminate Fire ability. By spending an action, you can choose any space within three spaces of you in your line of sight. Then, you roll a green die and force each nearby figure to suffer damage and strain based on your roll! Anytime you can deal damage without giving your opponent the chance to roll defense dice, you have a better chance of killing your opponent’s characters, and Indiscriminate Fire lets you target multiple foes at once. You may also call upon Bossk’s Trandoshan heritage to gain the advantage in combat. Trandoshans are well known for their regenerative powers, and Bossk is no different. With Regenerate, you recover two damage and discard all Harmful conditions at the end of each round. 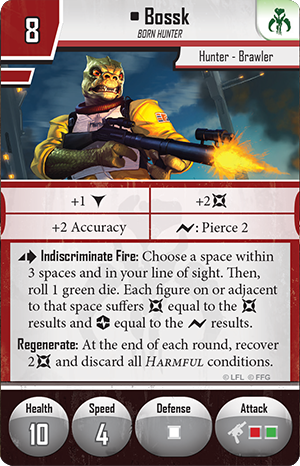 Even though Bossk rolls a white die in defense, your opponent will quickly learn that Bossk is much more difficult to kill than he first appears. 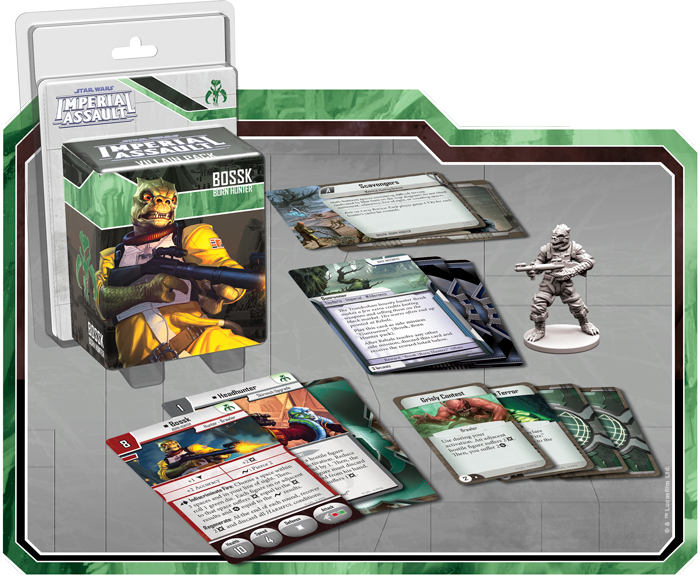 With a new mission that this Villain Pack introduces for your Imperial Assault campaigns, the heroes may come face to face with Bossk in the midst of a gunrunning scheme on Toydaria. Taking down Bossk and his allies is a difficult task, but if the heroes choose to do any other mission, the Imperial player immediately gains the power to summon Bossk into other missions as a villain. The other cards in this Agenda set offer additional ways to retaliate against the heroes. You can exhaust On the Hunt whenever a Rebel suffers strain in order to give an Imperial figure one movement point. One movement point isn’t much, but it might push you out of sight around a corner or bring you into range to make a crushing attack against a Rebel hero. Alternatively, you could use Furious Retaliation after one of your Imperial figures is attacked. 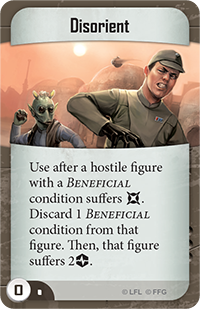 After the attack resolves, you can choose a nearby Rebel figure to suffer the same amount of damage suffered by your Imperial figure! 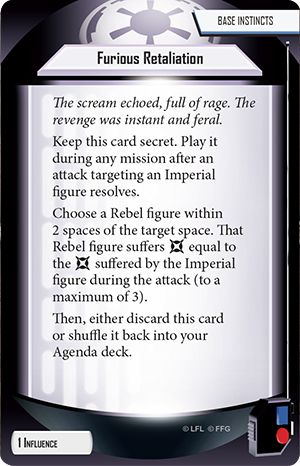 With Furious Retaliation, even your opponent’s successes give you the chance to deal more damage to the Rebel heroes. Obviously, Bossk is equally dangerous in a skirmish game. His powerful ability to deal out damage and his competitive point cost makes him a natural fit for any Mercenaries list. You may even choose to pair him with the Trandoshan Hunters from the Imperial Assault Core Set, and if you do so, you could certainly use the help of the new skirmish upgrade introduced in the Bossk Villain Pack. Headhunter is a one-point skirmish upgrade that can be attached to any of your figure groups. By exhausting Headhunter when a hostile figure suffers strain on your activation, you can reduce the amount of strain suffered by one. Then, your opponent must discard a random Command card from his hand. If he can’t, the targeted figure suffers a damage instead! Essentially, Headhunter allows strain to target your opponent’s hand of Command cards, rather than his deck. This gives you the opportunity to destroy your opponent’s options, and your opponent’s hand is a much more finite resource than his deck. Once you’ve depleted your opponent’s hand, you’ll be able to translate strain into extra damage faster than ever. 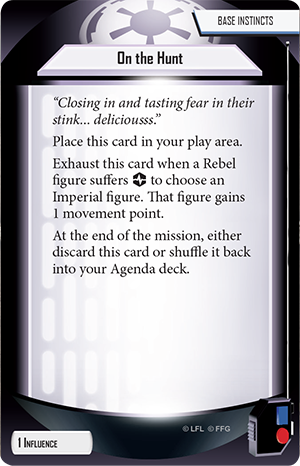 Many of the Command cards introduced in this Villain Pack directly interact with dealing strain. For instance, you may play Disorient after a hostile figure with a Beneficial condition suffers damage to discard the Beneficial condition and force the figure to suffer two strain. Alternatively, you may play Grisly Contest at any point during your activation. 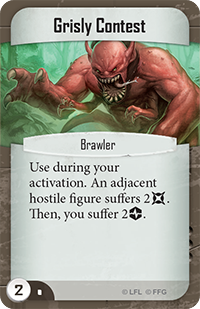 When you play this card, you force a figure adjacent to your Brawler to suffer two damage. The Brawler must suffer two strain in return, but if you’re setting up a crushing attack, an extra two damage that can’t be defended can make all the difference. Finally, you’ll gain access to Bossk’s personal Command card: Trandoshan Terror. 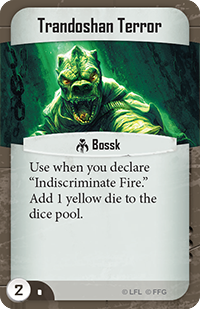 This card can be played whenever you use the Indiscriminate Fire ability, and it has a simple, powerful effect—it adds one yellow die to your dice pool. Rolling an extra yellow die might not seem like much of a difference, but it’s important to note that the yellow die is traditionally heavy on surges. When using Indiscriminate Fire, surges deal strain, so playing Trandoshan Terror can interact directly with all of your ways to punish your opponent for taking strain. You have your mark and the identity of your victim. All you need to do is hunt down your prey and collect the reward. Join Bossk with The Bespin Gambit and its corresponding figure packs to write a new chapter in your Imperial Assault adventures. 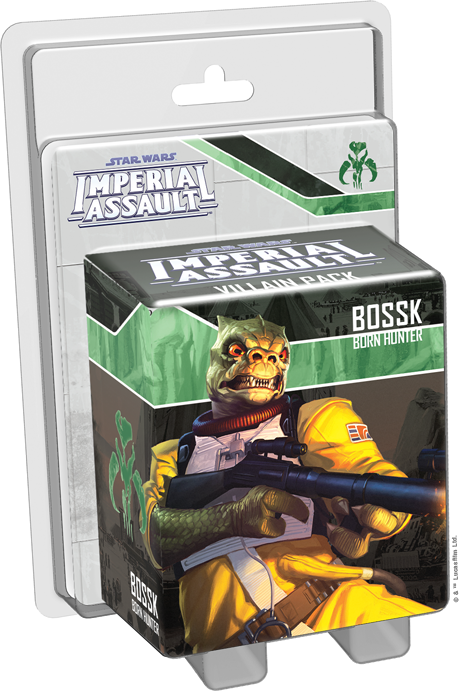 Look for the Bossk Villain Pack and other Imperial Assault expansions at your local retailer soon. You can pre-order your copies today!